Founded in 1980, Mail Boxes, Etc. Created a brand and system that became known worldwide as the leading alternative to using the United States Postal Service, but also as a leader in shipping, printing, and business service centers. However, the brand awareness of even an industry leader such as Mail Boxes, Etc. can pale in comparison to a brand that is synonymous with an actual color (“What Can Brown Do For You?”). United Parcel Service, better known as simply “UPS,” is one of those few specific brands that has become so strong in one industry that they can shift to becoming one of the dominant brands in another. And with the acquisition of Mail Boxes Etc. in 2001, and the subsequent re-branding of approximately 3,000 locations almost overnight, The UPS Store immediately became the biggest and best-known name in retail shopping centers. With that corporate union, The UPS Store was born. 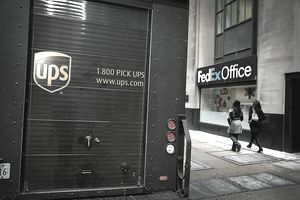 Three years later UPS’s chief rival in private shipping, Federal Express (FedEx), acquired Kinkos, arguably the leading brand in printing and other general business services, creating Fedex/Kinkos, which ultimately was rebranded as simply FedEx Office. With these two private shipping titans now in the printing, copying, packaging, and general business service retail center space, the entire face of that industry has changed. Rather than small, local locations making up the majority of the market, the public now has two established, polished brands that provide an expected high level of service and quality. Any local or even national competitors who want to be successful in that industry know how high the bar is, and that benefits consumers everywhere. With opportunities in more than 75 countries and territories, The UPS Store and Mail Boxes, Etc. is the global leader in its marketplace and includes over 4,400 locations. Franchisees of The UPS Store are entitled to numerous products and services such as Shipping and Packing, Mailbox and Postal Services, Copying, Finishing & Printing, Packaging and Moving Supplies, and Business Services that include fax, notary, and office supplies. English proficiency is a requirement for franchise ownership, and applicants may be required to take and pass an English proficiency exam. The UPS Store brand is a globally respected market leader. There is no doubt that franchisees will immediately enjoy the public trust and the established familiarity of a nationally recognized brand, but do the pros of owning a UPS Store franchise outweigh one very important and major con? The most advanced technology - The UPS Store franchising network utilizes one of the most innovative and highly developed digital information systems in the world. This technology enables UPS franchisees to deliver more than 13 million documents, pieces of mail, and packages every day. The cost for this sustained development is reportedly more than $1 billion annually and comes with an unequaled tracking and distribution capability. Number 1 in its category - Voted the #1 franchise in its category for 19 consecutive years by Entrepreneur Magazine's Franchise 500. High Ranking Overall – Entrepreneur Magazine also lists The UPS Store as # 17 over in its ranking of the Top 500 Franchises. Questionable Profitability – According to a very reliable source it takes “about $365,000 in annual gross sales” to produce a modest “$35,000/yr income for the owner” and “about 60% of all US stores do not break even.” In other words, you will not see a nickel in profit until your UPS Store does over $30,000 in monthly sales consecutively every month, and you have to hope you are one of the 40% of franchisees that sees any profits at all.